You probably know that I mainly use personal stereo devices to record in public spaces, and the couple of times that I did use a walkman or iPod to listen to music in the train or the metro, or while walking in the streets, I actually did not like the experience too much, and each time I soon turned of the music and took out the earplugs again. When outside I just almost always prefer to hear and listen to the 'random' chatting and other sounds that surrounds us. I had not seen nor heard a real Buddha Machine until last saturday september 9th, when Cosmo opened up his bag and put two of them on the table at FlexRex' place, where we had gathered for some roughish attempts at circuit bending a number of found electronic children's toys. 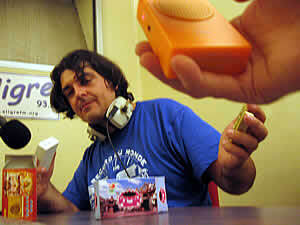 In an informative interview published on the Rare Frequency website, FM3's Christiaan Virant talks at length about the Buddha Machine and the buddhist chant box that inspired it. The chant box is used in Buddhist temples to chant or play prayers, and the factories that make them actually produce these gadgets in hundred of thousands of copies ... One of the explanations for the use of 'the machine', Christiaan says, is that instead of becoming a Buddhist monk, nowadays "more and more people are going into business or whatnot, so there are less monks to do the chanting for the Buddha, so they made a small box to do it in the place of a human ...."
The first one is a 'mantra chanting Ganesha', which appears to be available in other guises as well ... "An ideal product to have in your office or home, a unique gift for all occasions," one online publicity reads. 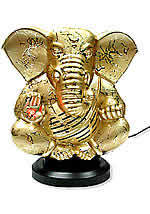 "Available in the form of Vighnaharta Ganpati - The elephant-headed god, divine destroyer of obstacles. Begin every auspicious journey of your life with blessings from vighnaharta shri ganesh. 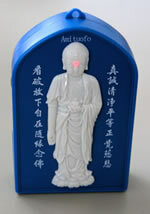 He removes all obstacles, vanquishes all evil, dispels all darkness and brings good luck and prosperity to all ..."
The third one, the blue 'Ami tuofo', is a box that Jerry Whiting got from the Amitabha Buddhist Society in Sunnyvale, again one in a series that comes in different forms. 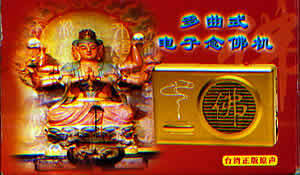 The Amitabha Pureland Web site has a page with detailed instructions on functioning and use of the Amituofo chanting boxes. "Everyone can take part in Chanting for Peace in their home - just turn on the chanting player and chant along with it ..."
The middle one, the "Divine Life" box, is also a 'music box', but of a somewhat different type, as this one is not loop-based. 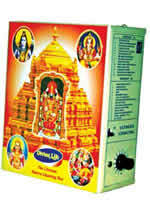 "Unlike the traditional chanting boxes, the Divine Life box comes with the full version of chants [and contains] two-and-a-half hour[s] of songs, and 21 mantras." 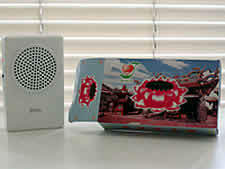 Ah ... well ... for the time being there's at the very least FM3's Buddha Machine. I'm writing to you from a company called Aarathi Electronics in Sri Lanka. We are a company that imports and market electronic items to the end user as well as to resellers in Sri Lanka and have a strong distributor network. Aarathi Electronics always look at giving innovative products to the market and present us looking at the possibility of promoting Chanting Loop Players. Going through your website and company profile I understood that your company manufactures components for radios and thought you would be in a position to produce this item. * We will supply the chanting mp3 track that should add to loop player. If you are in a position to design manufacture the said item, please let me know the following. 2. Lead time of manufacture. 3. Exclusivity and rites of the product. 4. Time length of the mp3 track. Please find below my company and contact details.